ISPConfig is an open source hosting control panel for Linux, licensed under BSD license and developed by the company ISPConfig UG. 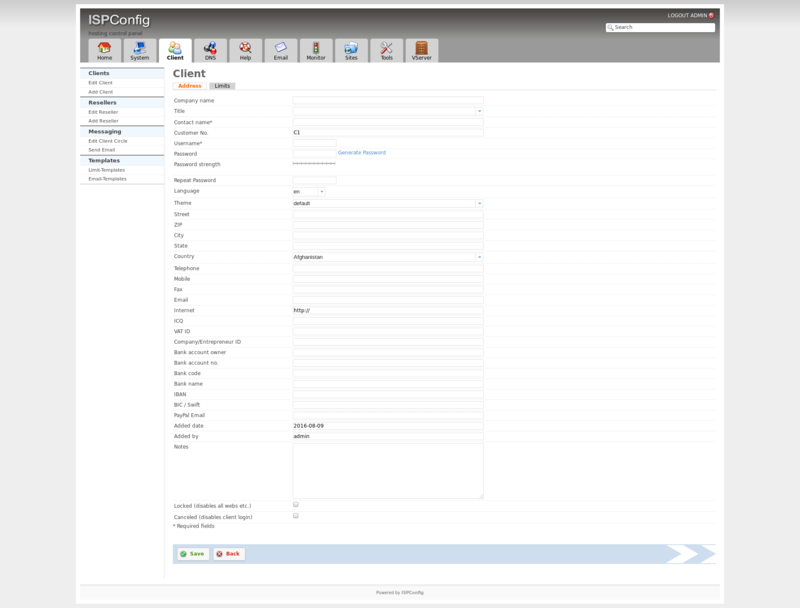 ISPConfig allows administrators to manage websites, email addresses and DNS records through a web-based interface. The software has 4 login levels: administrator, reseller, client and email-user. “admin” user password you will find after logging in into your VPS with “root” through SSH and executing command “cat ispconfigpsw.txt”. - On the top menu press "Tools"; - Then in the left menu choose "Password and Language"; - Enter your new password and save it. In the top menu select “Client” then press “Add new client”. Fill in all needed information and press “Save”. After that you will be able to update limits of the client. In the top menu select “Sites” then press “Add new website”. There you will be able to configure all information regarding your new website. In the top menu select “Sites” then in the left menu select “Databases” and press “Add new Database” button.